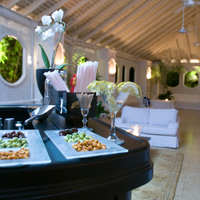 In Jamaica the top restaurant to visit would be the Dining Room and Round Hill Restaurant, located in Montego Bay. The classy bar (designed by Ralph Lauren) welcomes, then dinner is served on an open deck or in the Georgian hall. Each night features a different atmosphere and cuisine with daily specials; but seafood is served fresh daily so that diners who crave shrimp, crab, lobster, or fresh fish will never go home disappointed.